When Hall-of-Famer Stan Musial receives the Presidential Medal of Freedom from Barack Obama on Feb. 15, it won't be Musial's first time meeting a president, as it brings to mind his historic meeting with John F. Kennedy and a bevy of VIPs -- including notorious Chicago crime family mobster Sam Giancana. Next year will be the 50th anniversary of the meeting. 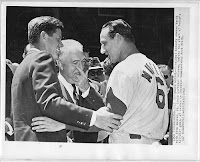 It took place during the 1962 All Star Game in Chicago, when Musial ascended to the presidential box at Wrigley Field to receive a warm greeting from Kennedy, who threw out the first ball, while Giancana looked on. Ironically, Kennedy had recently re-enacted the Medal of Freedom honor after it had been discontinued by President Dwight D. Eisenhower. It has never been fully explained what Giancana was doing there, though his association with Kennedy has been well documented. 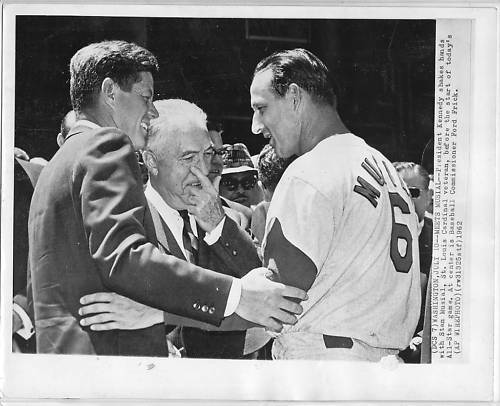 Also on hand were Vice President Lyndon Johnson, Speaker of the House John McCormack, Senate Majority Leader Russell Long and Baseball Commissioner Ford Frick. Kennedy was assassinated the following year, and Giancana was gunned down five years later. Musial, 90, the last surviving member of the group, will be presented the medal for his meritorious service to the nation in ceremonies presided over by Obama, who is also from Chicago. Musial is the fourth major leaguer to received the award, the others being the late Ted Williams, Jackie Robinson and Roberto Clemente. According to C. David Heyman, writing in in 2009 book "Bobby and Jackie, a Love Story," JFK was introduced by the late entertainer Frank Sinatra, a noted Democratic booster, to Giancana paramour Judith Campbell, ex-wife of actor William Campbell and a former Las Vegas showgirl. Campbell later was quoted as acknowledging simultaneous affairs with Kennedy and Giancana, beginning when Kennedy was still in the senate, and she claimed to have relayed messages between the two, plus payments from government contractors to government officials. Kennedy's father, former U.S. Ambassador Joseph P. Kennedy, has been widely believed to have had business interests in the sale of liquor during and predating Prohibition, and continued to have connections with spirits manufacturers even as late as the late 1940s, when his son was in the House of Representatives.